GGC Foundation or GEO Foundation: An independent, non-profit public foundation which oversees the GEO system. In this diagram, it also represents the GEO system/network in general. Outside Exchanges: These are exchanges not a part of the local currency system, and include GEO Foundation’s exchange and the GGTrust Currency Exchange. 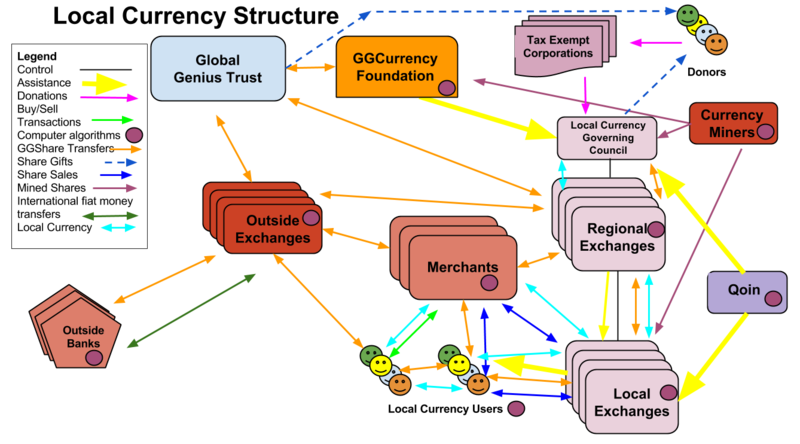 GGTrust and the GEO Foundation will encourage other currency exchangers to include E in their basket of currencies. Computer algorithms: The Ethereum computer protocols which create and use GEO will be open source and available for anyone to use. They will reside on hundreds or thousands of individual computers, operating as a network. The algorithms running on computers are represented by a dark magenta dot. Local users do not need the computer algorithms for using local currency, but do if they are transferring GEO. Global Genius Trust: The sponsoring organization for GEO and many of the local currencies. At least one class of GGTrust shares will be available to be used as currency in the GEO system, and interchange with the local currency. Tax Free Entities: US Government (and perhaps other government) registered non-profit entities will serve as portals for donor money into the local currency system. Donors may be able to claim tax deductions for donations to these non-profit entities. The receiving non-profit entity may choose to pass on earmarked funds to the Local Currency Foundation. Donors: Donors who are not investing to obtain equity shares may obtain US tax credits by donating through a registered 501c3 or 4 tax-free entity. Donors may receive gifts of GGT shares, local shares or other gifts as a token of thanks from GGTrust and the local currency system. Local Currency Users: Exchange currency for goods or service in the local area. If they need more currency, they can go to Merchants or to the Local Exchange Center. Local Currencies: Complementary currencies of various types will be eligible for trade within the GEO system. These currencies may be used in a single city or neighborhood, or throughout a country as a complementary currency. Local Currency Governing Council coordinates the use and introduction of the local currency and coordinates with local and national governmental authorities to provide community services in exchange for local currency. They are supported by the GEO Foundation and by Qoin. Qoin: Qoin.com is a designer and proponent of local complementary currencies. We will work with Qoin to design a model local currency, and to design variations to meet local needs. Qoin will provide assistance to the local currency and its various exchanges. Local exchange centers: Exchange centers will serve the users of local currencies for training them, coordination and recruiting of merchants and users, and integration with the systems of GGCurrency and national currencies. They coordinate with local community leaders for providing local currency in exchange for community labor. They provide exchange services of local currency into GGCurrency and national currency, and assist members in money transfer operations if needed. State and national exchange centers: Regional Exchange centers will coordinate exchange services, integration into banking services, provide merchant recruitment and advertising support, provide training for local exchanges and users, and coordinate with governmental agencies at non-local levels. They will also assist for integration with the GEO system in areas the local exchange center is not prepared to supply. Merchants: at the local currency level are recruited and trained to integrate the local and GEO into their usual business operations. They use local currency in buy/sell transactions, and also may buy and sell the local currency. Banks: Banks will interface with local and GEO at local, national and international levels. Local banks and credit unions may choose to provide integration services for Local Currency members. GEO Mining: GEO is created by performing complex mathematical calculations. These calculations are performed by all computers in the GEO network, but some members of the network will chose to provide specialized faster and more powerful computers which are specially designed for these calculations. They will produce a significantly greater number of GGCurrency than the ordinary user. Fees levied on mined currencies provide local communities with currencies for system members who provide community labor to earn shares. Donation Money: Donations to participating non-profit organizations, which is earmarked for subsequent donation to the Local Currency Governing Foundation. Pink Arrows. Mined GEO: The flow of new mined shares of GEO into the system is represented by dark magenta arrows. A portion of these new shares is diverted into the local currency for distribution to those performing community service. Local Currency: Local currencies will be used primarily in their local areas. Some local currencies will be designed to be interchangeable directly with GEO. Many more local currencies will be able to be exchanged with GEO and perhaps other currencies. Cyan arrows. Control/ownership: The solid black line designates control and /or ownership and/or responsibility between entities. Buy/Sell transactions: The green arrows designate buy/ sell or mercantile transactions using Local Currency. Share transfers within the GEO system are represented by orange arrows. Most of these electronic transfers occur outside of the local currency area, and many of these transfers from or to the local area are handled by the local or regional exchange centers, or by individual members with computers running the Ethereum software. Share Purchases: Purchases of Local Currency can be accomplished at the Local Exchange or at participating merchants. Blue arrows. Share Gifts: GGTrust and the Local Currency Governing Board may choose to donate currency shares in gratitude for donations earmarked to the local currency system. Blue dashed arrows. International Fiat Money Transfer: Bank wire transfers using national currencies are represented by dark green arrows from bank to bank. These are part of the local currency system only inasmuch as local currencies may be exchanged for GEO, and GEO subsequently for national currencies.